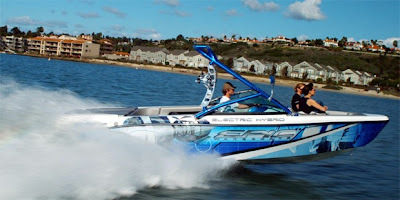 GadgetStation: It's A Hybrid Boat!!!!!!! The fuel consumption is amazingly reduced as much as 50 percent, while over 50 percent total carbon dioxide emissions reduced, and nearly 90 percent drop in carbon monoxide emissions. And in order to maximize your satisfaction, you’ll also get plenty of gadgets on-board, such as GPS Speed Control, a touchscreen interface, an entertainment systems for passengers. The wake board will be launched in July.